Milky Ocean in Hinduism is a primordial Ocean of milk which exists between cosmic eras. Srihari Vishnu sleeps on Adishesha, the giant serpent, who floats on the Milky Ocean. This is a famous picture and symbolism associated with Hinduism. It must be noted that it is also believed that Vishnu resides in Vaikunta on the Milky Ocean. Milky Ocean symbolically means absolute truth – when one attains this there is bliss. It is an attempt to convey to common devotees what is waiting for them when they cross the materialistic world. In Sanskrit and many Indian languages milky ocean is known as Ksheera Sagara. 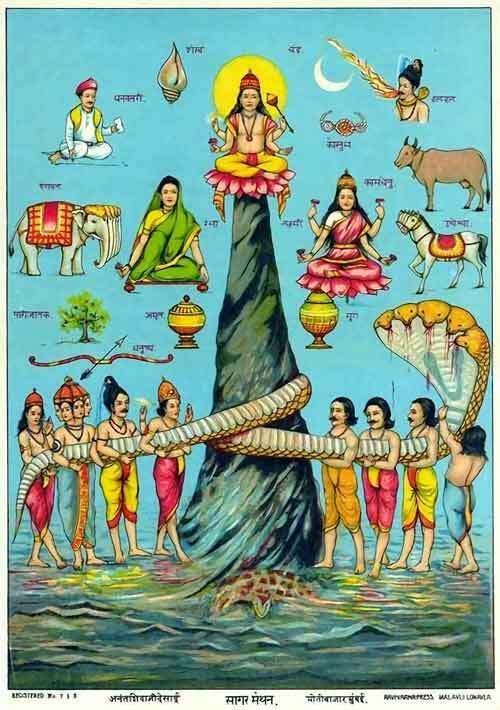 The most famous incident associated with milky ocean is that of the churning of ocean or Samudra Manthan by Asuras and Devas to attain Amruta or elixir of life. As per Vaishnavas, Vishnu sleeps blissfully on the milky ocean before the creation of the universe. Milky ocean is depicted on the walls of many temples and is constantly mentioned in devotional poems and songs. As per Swami Tejomayananda of Chinmaya Mission, the milky ocean symbolizes our subtle body of the mind, intellect, ego and memory. The churning must be done only in the subtle body. There may be various interpretations, but it is only in the subtle body (mind) that the churning must constantly take place. This churning the prelude to meditation. As per one story, Surabhi, the divine cow, who resides in the Rasa Tala, the seventh stratum below earth, shoots a single jet of her milk in the universe and this creates the milky ocean. The verge of the ocean all round is always covered with white foam resembling a belt of flowers. Those who escape from the clutches of birth and death through self realization dwell around the ocean subsisting on that the foam from the ocean.